A site in Cornwall could become one of 10 eco towns of about 5,000 new homes. 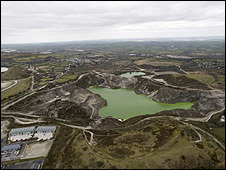 Imerys China Clay Community, near St Austell, is among 15 sites the Department for Communities and Local Government has shortlisted. But only 10 of the low-carbon, environmentally-friendly towns will eventually get the go-ahead. Ministers said the settlements would have to pass the highest environmental standards - but critics have claimed they could damage existing communities. Imerys said its scheme, which could be built across six sites including Nanpean, Bugle and Par, would be a "huge boost" for the area. It is the only shortlisted project in the South West. Imerys China Clay Community could include 1,500 affordable homes but Annette Egerton, leader of Restormel Borough Council, said she would want a higher proportion to be affordable, should the project go ahead. "We would normally want somewhere nearer 50% to be affordable homes," she said. "The really important thing is that the public is given ample opportunity to air their views. They are the people who will be affected by it - they may welcome aspects of it." Her views were echoed by Truro and St Austell Liberal Democrat MP Matthew Taylor who said it was "crucial" communities in and around St Austell were given complete detail about Imerys' proposals. "Whilst building houses to high environmental standards is in itself a good thing, it is equally important to look at wider issues of sustainability such as the impact on communities, social cohesion and the local economy, and the wider environmental issues," he said. "I am also concerned that any development puts local people and local needs at its heart, and is affordable for them if it goes ahead," Mr Taylor added. The company will announce full details of its Clay Country Vision next week. "The scale of proposals are significant for Cornwall, up to 5,000 energy efficient homes are being proposed - this is an opportunity to take a leading role in developing a low carbon economy in Cornwall," said an Imerys spokesman. 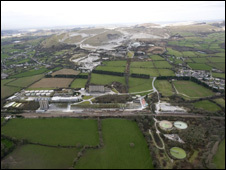 Imerys said its plan would "change the face of china clay country; restoring and regenerating the area with potentially 5,000 energy efficient homes being built, extensive new business and leisure opportunities being developed and renewable energy and green travel routes proposed." But Peter Combellack, a local resident from Whitemoor, has voiced his concern about an increase in the volume of traffic. "Traffic is going to be tremendous, it's bad enough getting in and out of St Austell now," he said. The 10 sites for the eco-towns will be finalised in the next six months. Ministers have said they want five of them built by 2016, with the other half completed by 2020.